With the terrible haze weather outside, Innisfree Malaysia being so sweet to set up an indoor beauty picnic for all of us! The indoor beauty picnic was held at Organic Lifestyle at Bangsar. I was really surprised by the lovely set up that really perfect for an awesome picnic session! Of course, what's a beauty picnic without the beauty products? We were introduced to the latest skincare range by Innisfree - Jeju Sparkling Mineral line - a new daily deep hydration skin care range that uses carbonic hot spring water (also known as Sparkling Mineral Water) as its main element. This beauty selection is crafted to make your skin clear and moist from within while giving you an everyday hot spring spa-like sensation. From a source that is 535m deep below, this globally rare carbonic hot spring water from Jeju Sanbangsan Mountain primal was formed some time 800,000 years ago. It has an average temperature of 31°C, which is lower than general hot springs and this helps keep the carbon content of the water high. The carbonic acid from hot spring has the ability to penetrate effortlessly into the skin due to its highly soluble state which increases the oxygen absorption ability of blood, muscles and skin. The sparkling mineral water provides you with 16 types of benefits from 3 types of high-concentration carbonic acid to 13 types of hot spring minerals which convey active ingredients to the skin. I don't fancy any green juice, but this one tastes delicious and refreshing! We had a meditation session with Ms. Shantini, founder of Organica Lifestyle and also welcome speech by Johnny Nam, innisfree brand manager before the beauty class by the lovely Ms. Purple Yap, innisfree assistant training manager. Fill the bowl with water (1.5L-2L), add in sachet 1 and wait until it dissolves. Add sachet 2 and stir in the water to make fizzy bubbles. Soak your face into the water for 2-3 minutes or wash your face using both hands to feel the effect of sparkling massage. Rinse off your face with lukewarm water. Our beauty class session begin with the first step of skincare regime - cleansing. 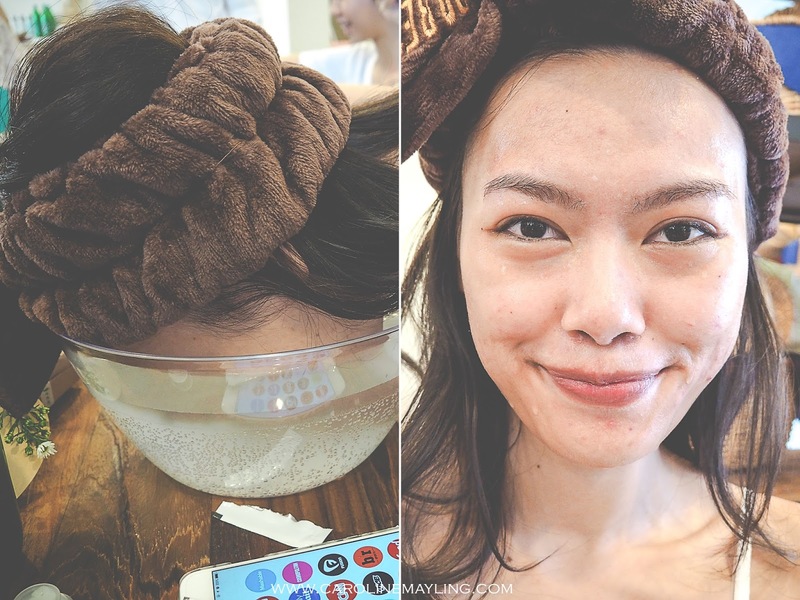 We used the innisfree Jeju Sparkling Mineral Powder for the cleansing step. It contains Jeju tangerine peel extract that cleanses away any dirt left inside the pores, giving an instant brightening effect after washing face. I personally love how it clears and moisturizes my skin, giving skin a relaxing spa-like treatment with carbonic acid hot spring water at the same time. innisfree Jeju Sparkling Mineral Powder (RM8/30g). We also learned that by applying the Green Tea Seed Serum before applying other skincare products will help on absorption into your skin. In other word, the serum acts as a booster to allow deep penetration of products. innisfree Green Tea Seed Serum (RM90/80ml). After applied serum onto our skin, we then used the Jeju Sparkling Mineral Skin toner that contains 88% sparkling mineral water that provides a powerful boosting effect. The ethanol-free toner is penetrated fast into the skin to smoothen the skin texture and to enhance the absorption of skincare products in the following steps. The acid-balanced formula helps maintain a healthy skin by restoring the imbalanced pH after face wash. All you need to do is soak a cotton pad in the skin toner and wipe the face or use your hands to apply over the face. innisfree Jeju Sparkling Mineral Skin (RM79/200ml). Next, followed by applying Jeju Sparkling Mineral Essence over the face. It contains 73.6% of sparkling mineral water. With the help of Micro Sparkling Technology, micro-sized carbonic acid bubbles that are smaller than pores are formulated to best fit onto the skin while facilitating penetration of active ingredients, making the skin clean, clear and moist. innisfree Jeju Sparkling Mineral Essence (RM110/70g). To provide ultimate moisture to our skin, we then applied the Jeju Sparkling Mineral Lotion/Cream (depending to skin type). For my sensitive and combination skin type, I applied the lotion that helps to improve oil-moisture balance on my skin. With 61.8% sparkling mineral water content, its skin-fitting lotion texture softens the skin, while the macadamia nut oil helps prevent loss moisture from the skin and keeping it hydrated without feeling tight. innisfree Jeju Sparkling Mineral Lotion (RM79/160ml). innisfree Jeju Sparkling Mineral Cream (RM110/50ml). Last but not least, we sprayed the Jeju Sparkling Mineral Mist that has 90% sparkling mineral water to get an instant and intense hydration to our skin. It resolves dryness while supplying minerals to keep skin moisturized anytime and anywhere. You can use this product before or after makeup. innisfree Jeju Sparkling Mineral Mist (RM52/80ml). innisfree Malaysia also prepared the cosmetic products for us to do our makeup after the beauty class. I am so happy to see one of my favorite products from innisfree - Long Wear Cushion - that comes with triple functions such as anti-wrinkle, whitening and sun protection. Further improved, the new long wear cushion also comes with a pore-blurring effect to ensure that your skin looks smooth all day long. innisfree Long Wear Cushion SPF50+/PA+++ (RM80/15g). 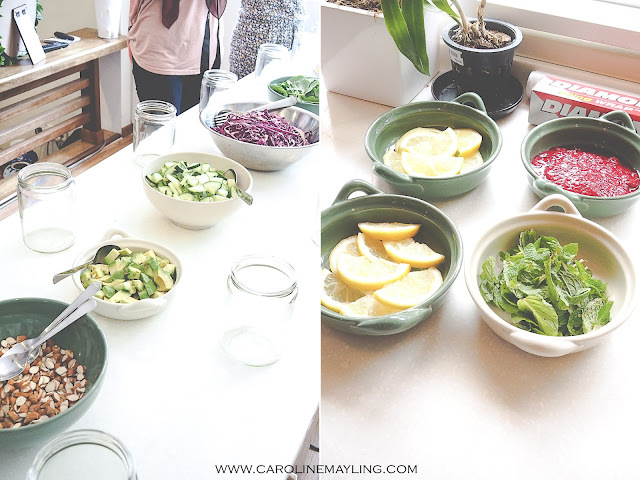 Apart of the beauty class, we also get to learn how to prepare the healthy salad in a jar and sparkling juice with just few simple ingredients. thanks innisfree for the lovely goodies in a basket and also the fresh hydrangea flower! 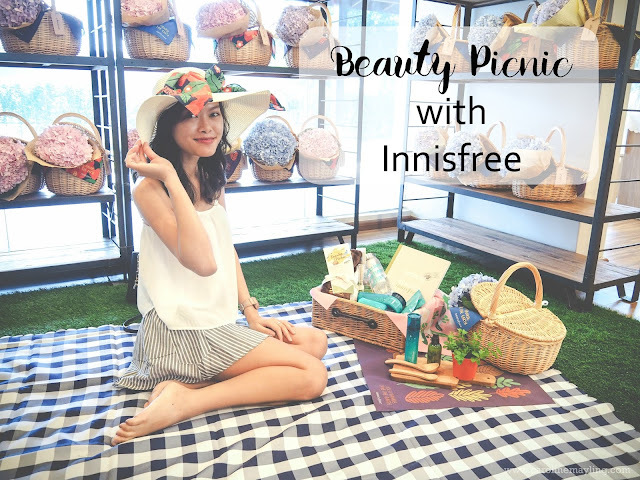 I had so much fun at the beauty picnic with innisfree and also loving the new Jeju Sparkling Mineral line already! Do not miss the in-store promotions for the month of September and October 2015! Jeju Sparkling Mineral Essence Special Set (RM110) - includes Jeju Sparkling Mineral Essence (70g), Jeju Sparkling Mineral Skin (25ml), Jeju Sparkling Mineral Lotion (25ml) and Jeju Sparkling Mineral Powder (30g). Limited in the month of September 2015. Sparkling Mineral Bottle - A limited edition innisfree Sparkling Mineral Bottle in blue or white, both are available for your personal collection whenever you purchase innisfree Jeju Sparkling Mineral Essence at RM110 each throughout the month of October 2015.
this looks like a great event, especially the food! i've still yet to go to an event!